Since [practice:year-founded], the dedicated and compassionate veterinary team at Ingleside Animal Hospital have successfully performed spay and neuter procedures on many male and female cats of all breeds and ages. We have also helped educate cat owners throughout Arizona about spay and neuter procedures. These include when to spay or neuter a cat, what to expect during and after surgery, and why cat spaying and cat neutering is essential to helping control the pet population problem in the state of Arizona. We strongly believe that responsible cat ownership is synonymous with spay and neuter procedures. Therefore we have compiled some of the most frequently asked questions here to help you learn more about this important service. Cat neutering refers to the castration, or the removal of the testicles of a male cat so that he cannot impregnate a female cat. 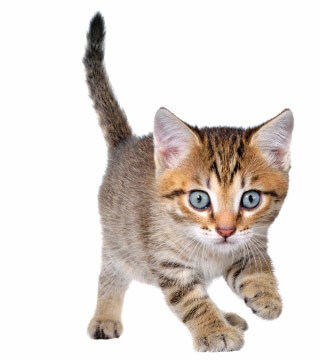 Only a veterinary surgeon can properly and safely perform cat neutering surgery. Your veterinarian will provide postoperative instructions for you to follow. What Is Spaying A Cat? Spaying a cat refers to the ovariohysterectomy, or the removal of portions of the reproductive system of a female cat so she cannot get pregnant and give birth to kittens. Cat spaying is a surgical procedure that a veterinary surgeon can properly and safely perform. Spaying a cat is a very routine surgical procedure, and it carries a minimal risk for serious medical complications. Your veterinarian can also provide post-operative instructions for you to follow. Although spaying a cat could result in some discomfort right after surgery, your veterinarian will take various measures for pain relief. The steps to ensuring your cat has the most comfortable and safe recovery possible from spaying surgery are identical to the recovery recommendations provided above for neutering. If you are concerned about spaying your cat, we urge you to ask the veterinarian at your next visit for help making an informed and responsible decision. Why Should You Spay Or Neuter Your Cat? There are many valid reasons to spay or neuter your cat. According to AmericanHumane.org Approximately 3.7 million animals are euthanized at shelters annually because there just are not enough willing and able adopters for them. Spay and neuter procedures ensure that you are not adding to this number, and that no offspring your cat has ends up a fatal statistic. To support this unpleasant reality, consider the fact that, according to Feral Cat Project, a non-spayed female cat can be responsible for producing up to 100 other cats throughout her lifetime, including the litters of kittens her un-spayed kittens will eventually go on to have. This incredible number can be prevented though, simply by caring enough to spay or neuter your cat. When Should You Neuter A Cat? We recommend spaying and neutering between 4-6 months of age. In some cases, male cats can become sexually mature before 6 months of age, which means waiting to neuter a cat can cause accidental pregnancy. Also, kittens tend to be more resilient to minor surgical procedures than adult cats. Therefore, undertaking cat neutering surgery sooner rather than later helps ensure minimized risk and quicker recovery time. If you are not sure when to neuter a cat, please consult the veterinarian at your next visit. Scheduling an appointment with our veterinary team for spay and neuter procedures is as easy as picking up the phone, or sending us an email. Our experienced spay and neuter staff is here to help answer any questions or quell any concerns you might have, as well as to help schedule a surgical appointment for your feline friend at our spay and neuter clinic.